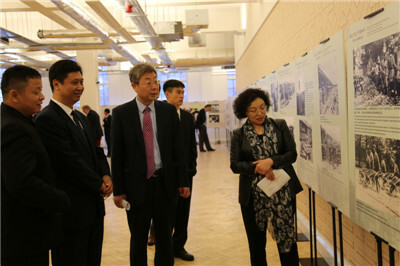 On November 6, 2018, Minister Ma Hui attended the opening ceremony of Cherishing Peace through Remembering History of War: Photo Exhibition of Chinese Labour Corps of WWI hosted by the Overseas Chinese Affairs Office of Shandong Provincial Government in London and the discussion afterwards. Nearly 100 people attended the event, including Wu Guan, Deputy Director of Shandong Foreign Affairs Office, Xing Hongxia, Director of Shandong Overseas Chinese Association, Wang Chun, President of UK-Shandong Association, Louise Hyams, Councillor of Westminster City Council, Thomas Chan Esq DL, Representative Deputy Lieutenant for the London Borough of Redbridge, and representatives from the Meridian Society, Ming-Ai (London) Institute, the descendants of Chinese Labour Corps of WWI and other Overseas Chinese representatives. 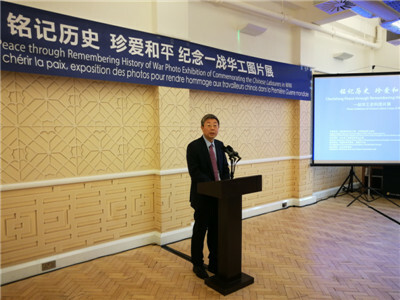 Minister Ma said that it is of great significance that Shandong Province brings the photo exhibition to the UK at the centenary of the end of WWI. The Chinese Labour Corps forms part of the history of WWI. A century ago, 140,000 Chinese went through numerous hardships to come to the battlefields of the Western Front of WWI. They fought alongside the soldiers of the Allies, providing logistics support. They have made indelible contribution to ensuring the early ending of this ravaging war. Ma noted that the Chinese Labour Corps also forms part of the Chinese history. He said, "China had endured a century of humiliation since the Opium War. Sending the Chinese Labour Corps to the battlefields of WWI and declaring war against Germany represented the efforts of the Chinese government then to improve China's international status and end the misery of the Chinese people." "Today, one century on, China is no longer a weak country steeped in poverty. Thanks to 40 years of reform and opening up, China has created a miracle in the history of world economy. China is not what it was a hundred years ago. I am confident that a prosperous and strong China will make new and greater contribution to world peace and prosperity", Ma remarked. Minister Ma pointed out that the Chinese Labour Corps has its rightful place in the history of China-UK relations. But for various reasons, their stories were forgotten and denied the respect they deserved in the decades after the War. In recent years, the British mainstream society and people from all walks of life have come to recognize and value their contribution. The Chinese community in the UK is going to build a monument to commemorate the Chinese Labour Corps of WWI, which is a highly meaningful endeavour and constitutes a positive contribution to the China-UK relations. 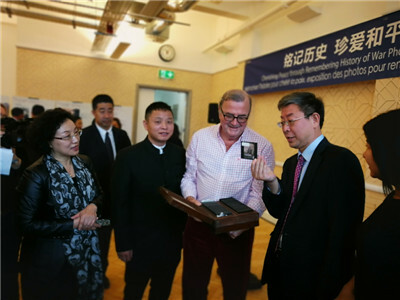 In closing, the Minister said, "Just as Ambassador Liu Xiaoming wrote, we should 'remember the historical contribution of the Chinese Labour Corps in WWI and write a new chapter of China-UK friendship'. I believe this is the best way to remember them." Deputy Director Wu Guan said that amongst the Chinese Labour Corps of WWI, over 80,000 people came from Shandong Province. Many photos in the exhibition were never publicized before, and they help restore the history of Chinese Labour Corps. Shandong Province will continue to cooperate with the UK and other countries to enable more people to learn about this part of history. President Wang Chun, Steve Lau, Chair of Ensuring We Remember Campaign, Zhang Chunsheng, Founder of the Digital Museum for the Chinese Labour Corps of WWI, and Christopher Arnander, Author of Betrayed Ally - China in the Great War, all expressed their support for holding exhibitions, building a monument, telling stories and publishing books about the Chinese Labour Corps and regard these as the best way to help Chinese and British people better understand the contribution and sacrifice of the Chinese Labour Corps, remember their histories, cherish peace and promote friendship and cooperation. Cheng Ling and Ma Jingdong, descendants of the Chinese workers of WWI, related respectively the stories of their grandfathers who were recruited to provide logistics support and lost their lives in the European battlefields. John De Lucy, grandson of an officer of the Chinese Labour Corps, shared his grandfather's story of recruiting Chinese workers, together with copies of the photos of those workers taken and kept by his grandfather.